The Antonopoulos Group is pleased to announce the opening of a new restaurant in Old Montreal, the Taverne Gaspar. 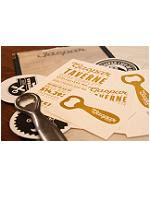 Adding to the Group's many establishments in the neighbourhood, the Taverne Gaspar will overlook the rue de la Commune and the St-Lawrence River, right next to the Auberge du Vieux-Port. At the helm, Zach Suhl, former owner of Brunoise Restaurant and Brasserie and Chef Mario Guerrera, formerly executive chef of the W Hotel and sous-chef of Cube Restaurant. The Chef will offer accessible and comfort cuisine inspired by British gastropubs with French and Quebecois accents. Among the house specialties, a trio of savoury tarts, scallops with pork belly and spatchcock Cornish hen, in addition to the "Daily Special" menu offering traditional dishes. Local beers on tap will be featured, including the Gaspar house beer, a Montreal lager prepared by the brewers of MTL Premium Lager. In addition, classic and creative cocktails, a wide selection of spirits, and a carefully selected wine list, will be offered. With authenticity and conviviality in mind, the design of the tavern has been entrusted to Camdi Design. Raw materials, oak tables and woodwork, copper accents, antique mirrors and fixtures all perfectly complement the stone walls and the original cachet of the room, nestled in an old 19th century warehouse. The long bar made of old joists and beams salvaged during the structural work is crowned by a copper counter and completed by a raw bar where one can sit and watch the shucker prepare oyster and seafood platters. An eclectic background music mix of indie, classic, blues and folk rock will complete the Taverne experience. The tavern's seating capacity will be 120, and in the summer season will overflow with an additional 60 on a terrace on the rue de la Commune. It will also have a room accommodating up to 60 people, available to patrons for the organization of private events. For the Antonopoulos Group, the opening of the Taverne Gaspar also represents another initiative supporting the development of Old Montreal. "Following the success of Méchant Boeuf Bar-Brasserie in the neighbourhood, we are very proud to create a new local destination on rue de la Commune. We hope thus to contribute to the year-round revitalization of this important artery which provides access to the river for all Montrealers, and help it join the ranks of other world-famous waterfront boulevards and promenades," said Dimitri Antonopoulos, the Vice President of Marketing and Development of the Antonopoulos Group.